If you are reading this article, then there is a very good chance you are asking yourself this very question. The answer may vary depending on who you ask, and like most questions, the way you word the question itself. If the question is "do I need to prune my tomato plants? ", well then the simple answer is No, you do not. However if you were to start asking experienced tomato growers if there is a benefit to pruning your tomatoes, you will find the answer is a resounding yes! It is usually a good sign when a tomato plant starts growing off at a record pace, in fact this is what you are looking for. You need to be aware however that a rapidly growing plant can lead to a few problems in the long run. If left to its own devices, a tomato plant will grow very quickly and could eventually become so top heavy that it the plant will fall over once it starts bearing fruit. This can lead to a lot of diseases. Now you might read that last sentence and say to yourself, well that's what stakes and cages are for…and you would be correct, you could do that, but there are other reasons why pruning is the better option. Tomato plants are nothing more than sugar factories powered by the sun. In the first month of its life the plant devotes virtually off of its sugar into the production of new leaves, causing it to double its size roughly every two weeks. As it continues to grow, the plant will eventually produce more sugar than the single stem can use and that is the point when it starts making new stems and it will begin to flower. This will typically occur around the time that the plant has expanded 10 or more of its leaves and is generally about 12 to 18 inches tall. It is around this time that the entire structure of the plant begins to change as it gets ready to start bearing fruit. 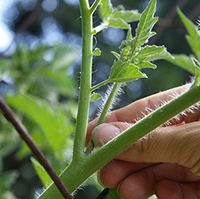 When you are pruning tomato plants, the goal is to maximize the plant's ability to convert the sun's energy, while reducing the risk of disease as much as possible. The way you do this is through pruning. By pruning your tomatoes you can ensure that every leaf has ample room and is not laying on the ground. When a tomato plant grows out of control it tends to become very dense which forces a lot of its leaves to survive in constant shade from other leaves. This causes the plant to produce far less sugar than it is capable of and needs. If any leaf starts using up more sugar than it is producing, the leaf will ultimately turn yellow and fall off the plant. You have probably seen this happen repeatedly in unpruned tomato plants but could not understand why. 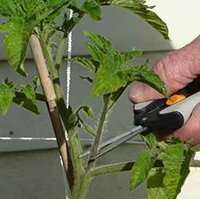 Pruning tomato plants will actually allow them to produce larger tomatoes several weeks earlier than one that is allowed to grow unchecked. The reason for this difference is because a properly pruned tomato plant with a single stem is presenting virtually all of the leaves it has to the sun. since the plant is not trying to support additional stems, all the extra sugar production is fed into the developing tomatoes. 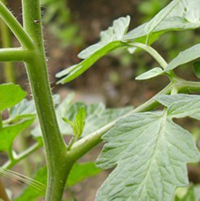 The more stems a tomato plant has the more fruit it will produce, but the fruit will be smaller because more of the sugar production is diverted to the additional stems rather than the fruit. There are also substantial health benefits to pruning tomato plants as well. A properly pruned tomato plant actually allows for better air circulation between the leaves so the plant will dry off much faster after a watering or rainfall. This actually helps to prevent fungus and bacteria from spreading around the plant. If you take care to stake your tomato plants properly too, there will be far less chance of the soil to splash up onto the leaves of the plant as well. Tomato plants that are properly staked and pruned will generally have fewer problems down the road with rotting and leaf spots because their leaves will stay much drier and away from the soil that is filled with pathogens. So some good tips to follow when growing tomatoes is to always keep your plants from touching the ground; make sure you allow for adequate space between the plants; and make sure you wait until the plants are dry before you decide to prune them or tie them off. These tips will lead to more healthy plants. 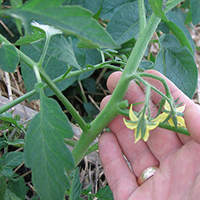 There are two basic ways of pruning tomato plants. The simplest way is to just pinch off the sucker when it first sprouts. If you get to them early enough you can easily grab them at the base and bend them back and forth until they snap off. Pruning this way will allow the plant to heal the wound easily. If you wait too long however the sucker will become too tough to snap and you will have to cut it. 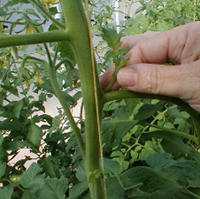 The other method of pruning tomato plants is called Missouri pruning. In this method you do not pinch off the sucker as soon as it forms but rather you wait until it has 2-3 pairs of leaves. Then you pinch off the stem just above the first pair of leaves rather than at the base of the stem. The advantage to this method is you are giving the plant a few more leaves for sugar production. The downside is new suckers will eventually form on the new stem and this will add to your pruning later on down the road.